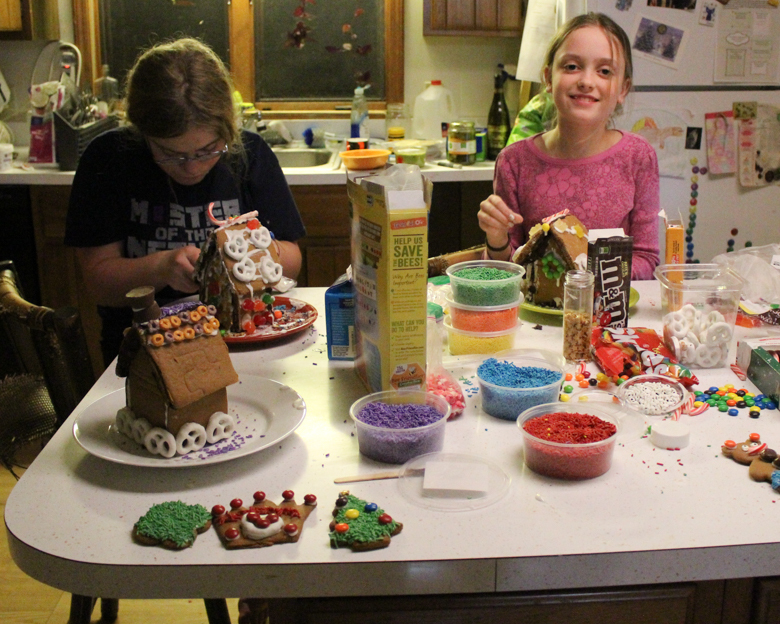 If I had to pick out a favorite holiday tradition, it would be making these gingerbread houses. It's super messy, as in I'm still scraping hardened royal icing off of the kitchen table, and it's chaotic, and there's just way too much sugar and artificial dye involved, but everyone is in the same room, everyone is happy (well, it took two tries to catch the teenager at a time when she was willing to be happy, but that's why God invented the chest freezer...), everyone is drinking eggnog and listening to Christmas music, and it's nice. It's just really nice. 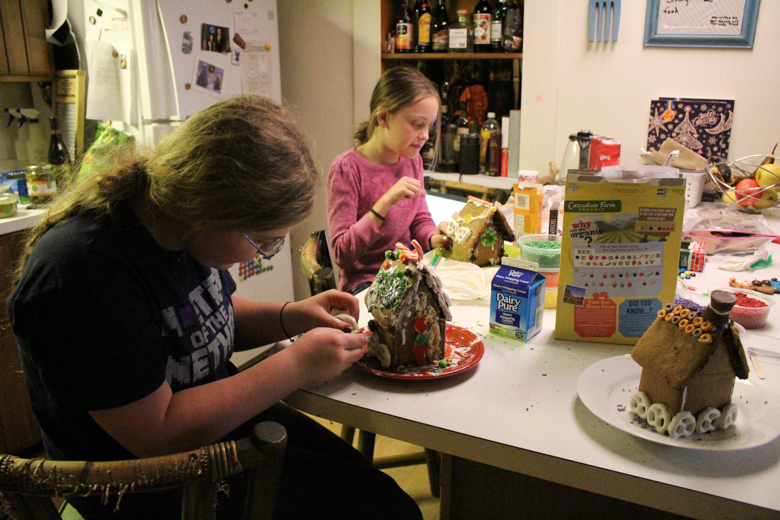 We have made these DIY gingerbread houses the exact same way for the past eight years (EIGHT YEARS?!? See, this is why I blog, because my blog keeps all my memories for me!)... 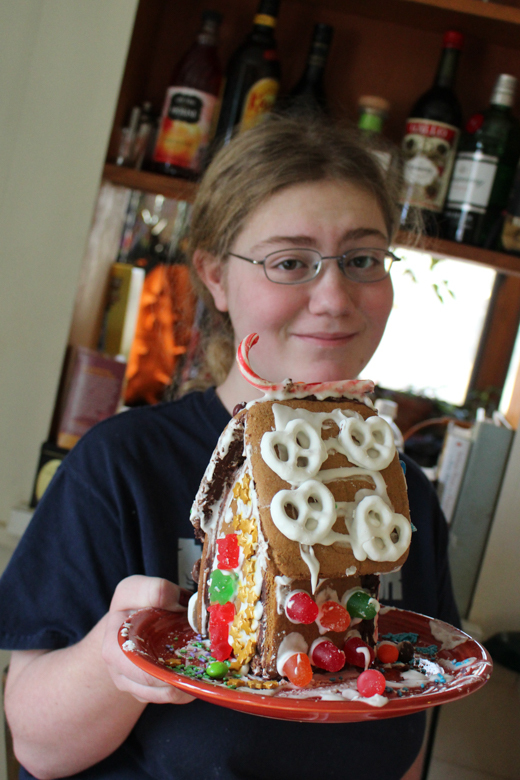 until this year, when the webpage holding the gingerbread recipe that I always use was unexpectedly broken. Sigh, Internet. 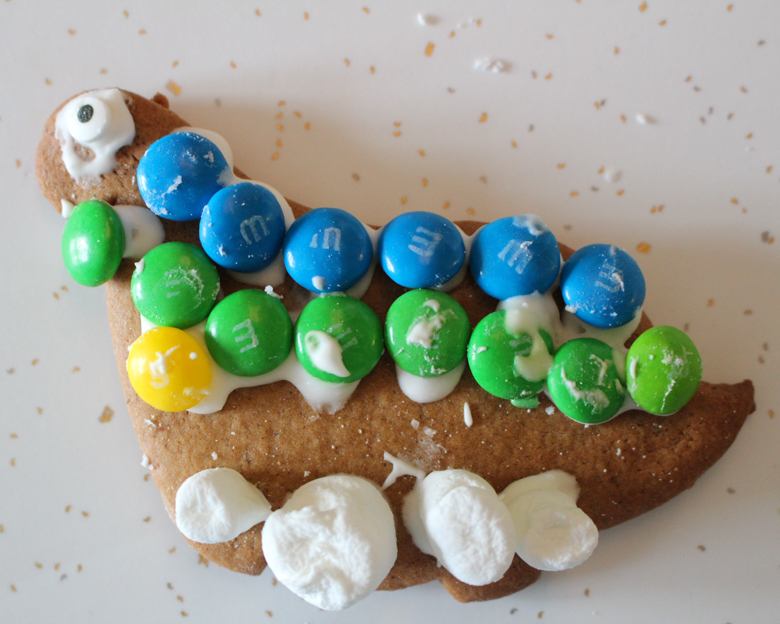 The good news is that the replacement gingerbread recipe that I used instead is actually way better! Yay! And I even made it with coconut oil instead of Crisco, and it turned out great! It hardened up fast after coming out of the oven, though, so I didn't get all the pieces trimmed as well as I would have liked. The bad news is that the gingerbread recipe was so much better that I got cocky and decided to abandon my eight-year-long usage of melted chocolate to hold together the houses and instead use royal icing like everyone else. I just don't have the patience to stand there holding house pieces together for 20 minutes while they take their time about drying, and neither did my helper, Syd. After her house fell down three times and my house fell down twice (of course, the house where I just put the walls together and then left it alone for an hour did fine...), I pulled them both apart and started all over again with an emergency bag of chocolate chips, which I then tried to melt in the microwave instead of on the stovetop because I was impatient, so they started to curdle and Syd and I just kind of muscled the chocolate onto the house edges and MADE them stick together. 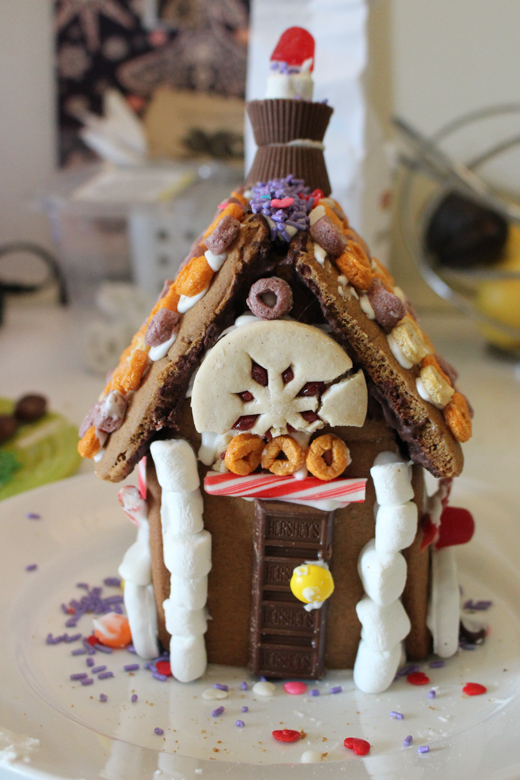 Use melted chocolate to put your houses together, Friends. My even better trick is to use melted chocolate, then put the whole house outside in the freezing cold. Hardens it right up, although these days I also have to set a guard on it so that the chickens don't sneak over and eat it. But after you've broken a sweat, sworn several times, BUT your houses look more or less stable, you can haul out all the candy, pour rum into two eggnogs, and let the fun begin! 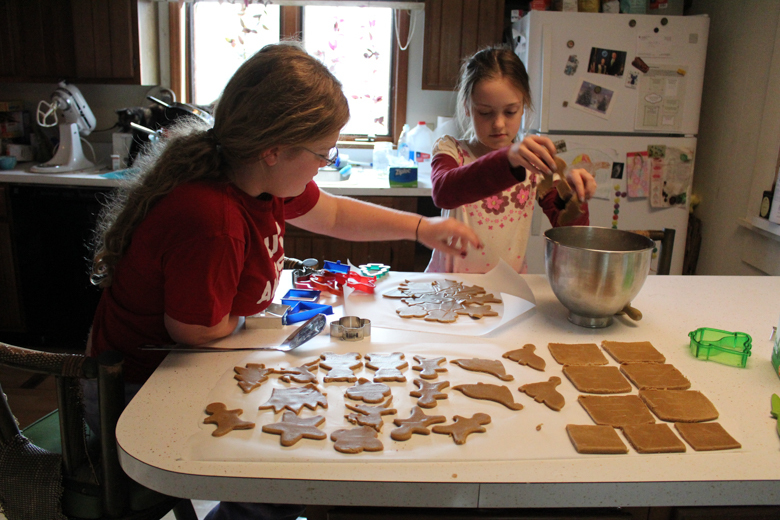 We always decorate cookies on Christmas Eve, because SANTA, so most of the gingerbread cookies that I baked are in the freezer, but we don't eat our gingerbread houses, so we HAD to decorate at least some cookies to eat! 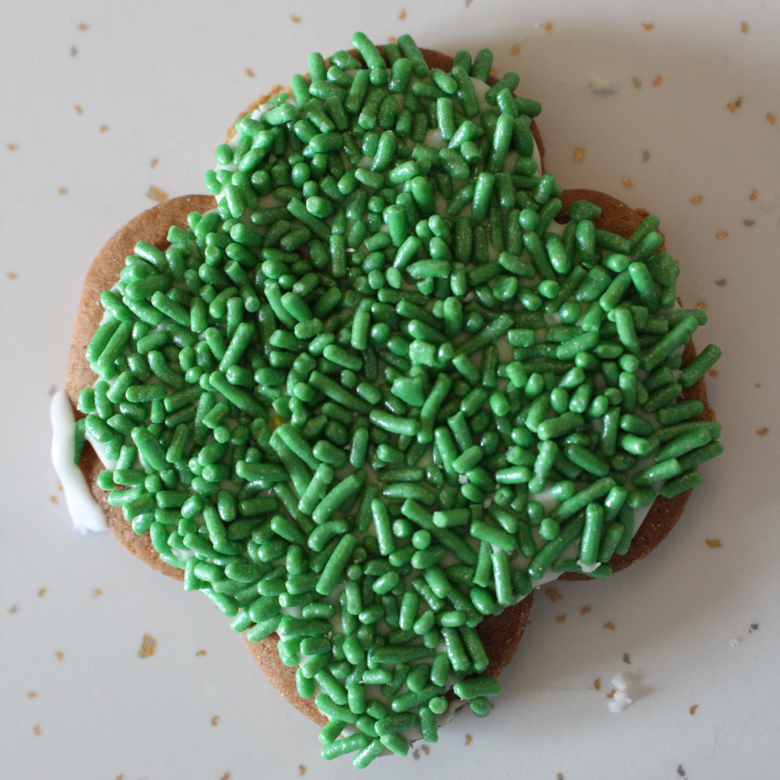 And my own personal creation--Girl scout trefoil!!! gingerbread Scrabble. I really want to make this! 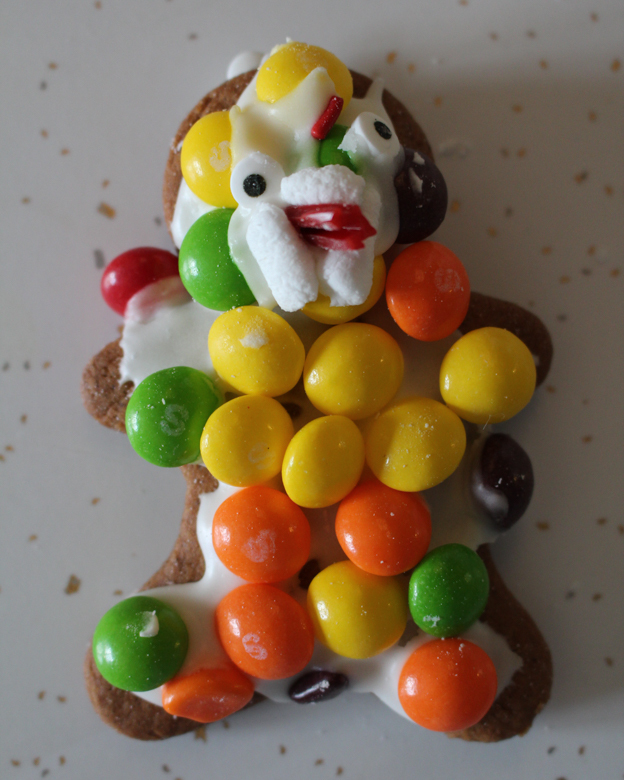 gingerbread ghosts. 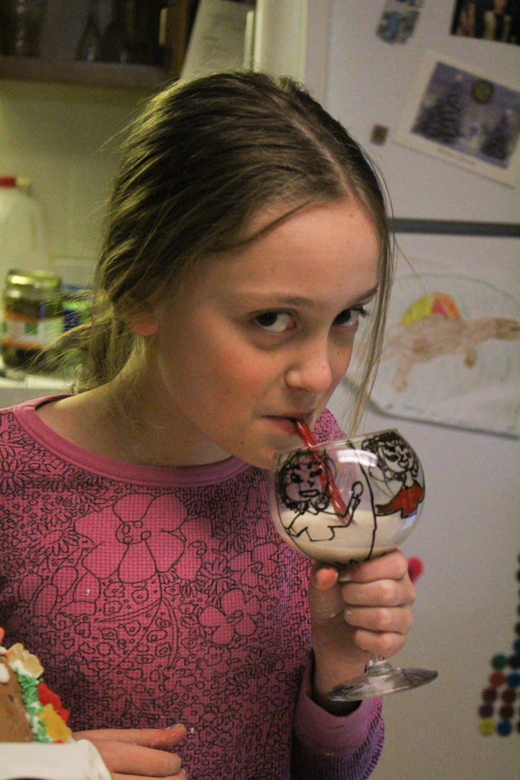 These are technically for Halloween, but my kids would happily make these anytime. cardboard gingerbread houses. I think that these would be cute to make for a class or a Girl Scout troop, and then raid all of your craft supplies for the decorations. 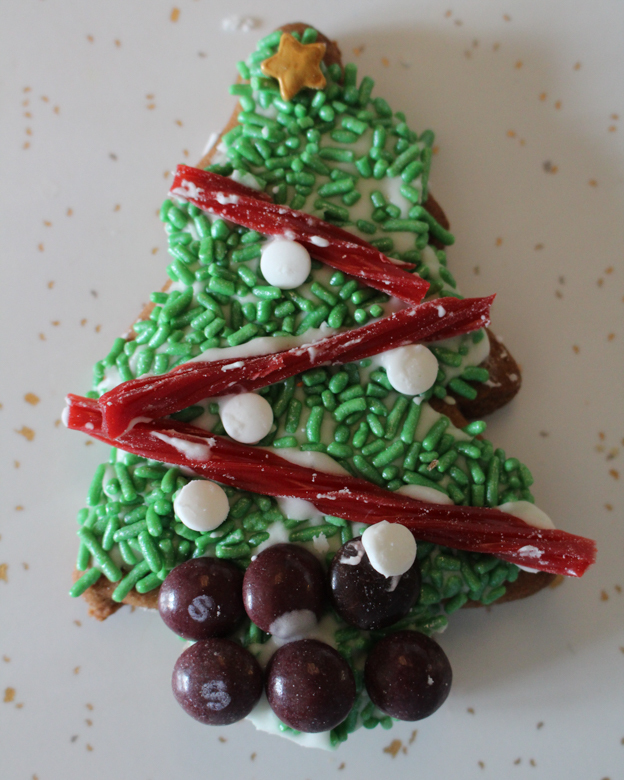 gingerbread boy garland. 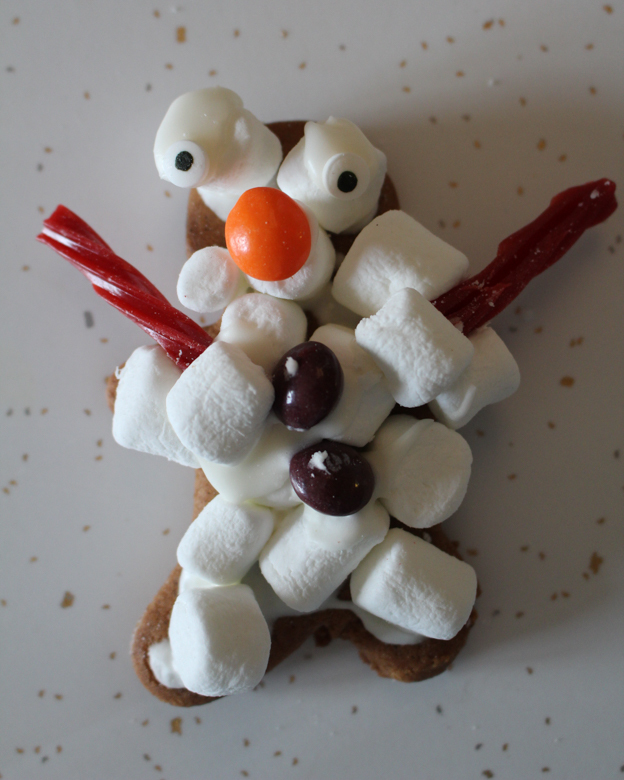 These are super cute, if you don't mind not eating your gingerbread cookies! Valentine's Day gingerbread house. If you don't get to gingerbread houses before Christmas, just change the color scheme to all red and white and do it for Valentine's Day! 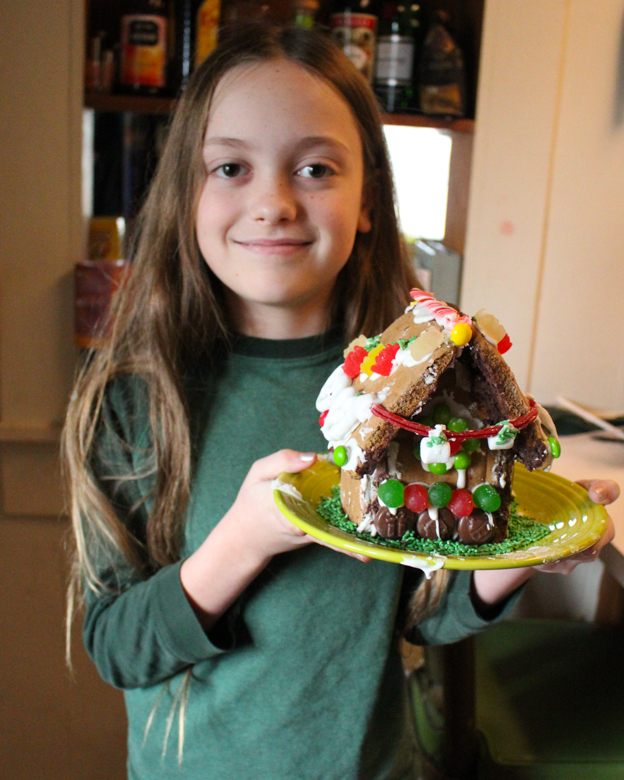 life-sized cardboard gingerbread house. Syd made this for her candy-themed birthday party a few years ago, for a life-sized game of Candyland. It would make such a cute indoor playhouse for a kid to decorate! gingerbread Stonehenge. 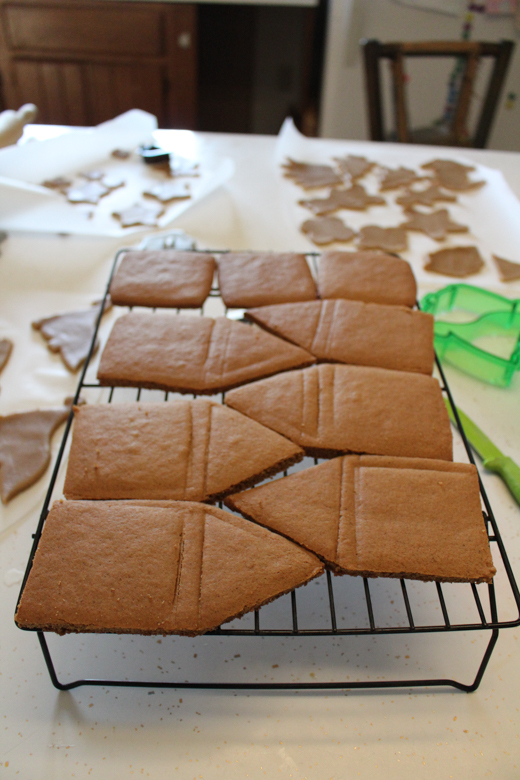 Next year while the kids are doing their houses, I might make myself a gingerbread Stonehenge. gingerbread house ornament. Super elaborate, but super cute! Today's Christmas tradition is letters to Santa, to be written and mailed--Syd is the one who reminded me of that one, and asked me to put it in the kids' schoolwork plans this week. Normally, I have the kids put the letters in the mail, then I sneak out later and retrieve them so that Matt and I can write replies. One memorable year, I didn't get out to the mailbox in time and berated myself terribly, but you know what arrived in the mail the next week, addressed to my children? Letters from Santa! I can only imagine that our postal worker took it upon himself to write the replies and put them in our mailbox, because the kids' letters certainly didn't have return addresses, just envelopes scrawled with "SANTA CLAUS, NORTH POLE," and probably some drawings of reindeer. This year, however, I plan to outsource the letters by mailing them to Santa Claus, Indiana, where some of Santa's elves who volunteer there will mail back replies to the children. If your kids tend to write their letters early in the month, you can also use Santa's mailing address in Anchorage. Today is also the deadline to order something from my Pumpkin+Bear etsy shop and have it shipped before New Year, so this weekend I'm going to make etsy orders and sew a ridiculous number of homemade gifts, and then next week, the kids and I are going to relax and enjoy the season. Except for AP European History, of course. AP European History stops for nothing!